How’s your spring closet cleaning been going? I’ve been on a tear this year, literally carting bags out for donation and consignment. I’ll be the first to admit I have waaay too many clothes and all the clutter is getting in the way of the things I actually want to wear. Lucky for me there’s a Current Boutique nearby, so I’ve been hauling over new bags of clothes to consign almost every other week. If you’re not familiar, this store is a DC area gem. I’ve been shopping and consigning at various locations for years now! Can you believe they recently celebrated their 10th anniversary? I was so excited to meet their founder, Carmen Lopez, at the anniversary party. After seeing so many local boutiques open and then, sadly, close in the DC area, Current Boutique’s longevity is very impressive. 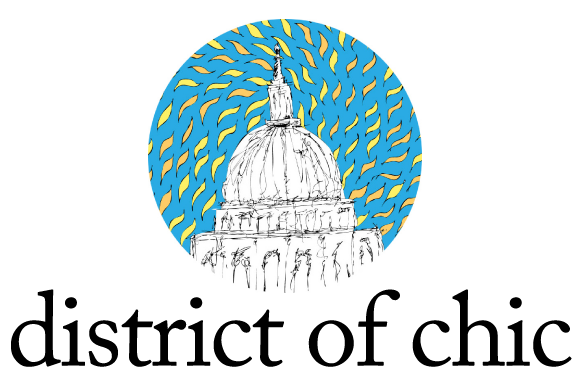 And now, in addition to their 4 DC area locations, they’ve now launched an ecommerce site so anyone can shop or consign. 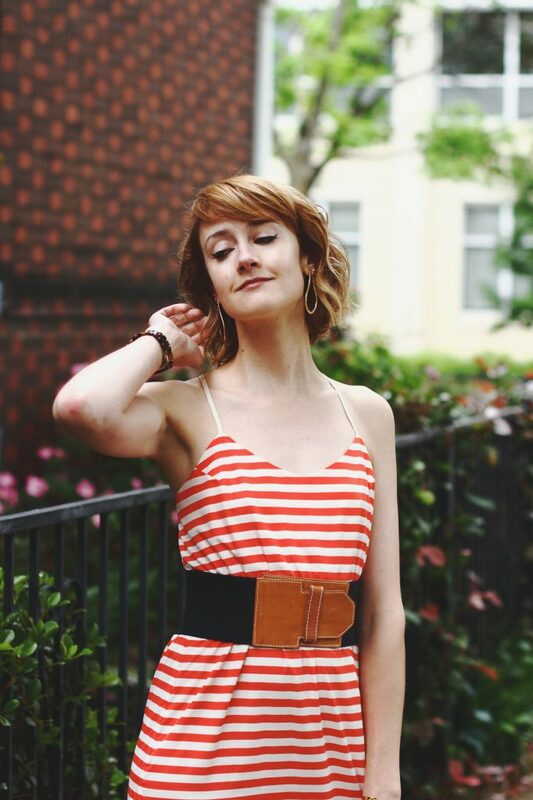 So if you’re cleaning out your closet like I am (or maybe looking to score a second-hand gem like the $19 dress I’m wearing above), head over to currentboutique.com and get to it! 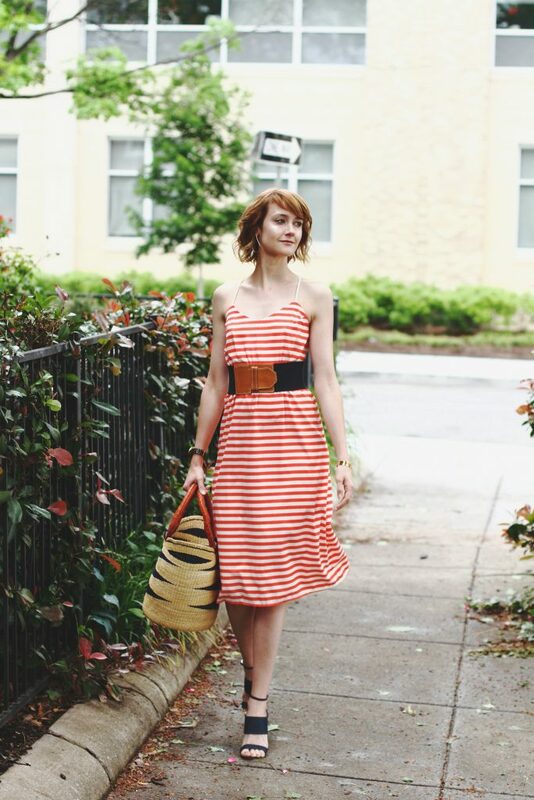 I love this dress…the red stripes is such a beautiful detail! 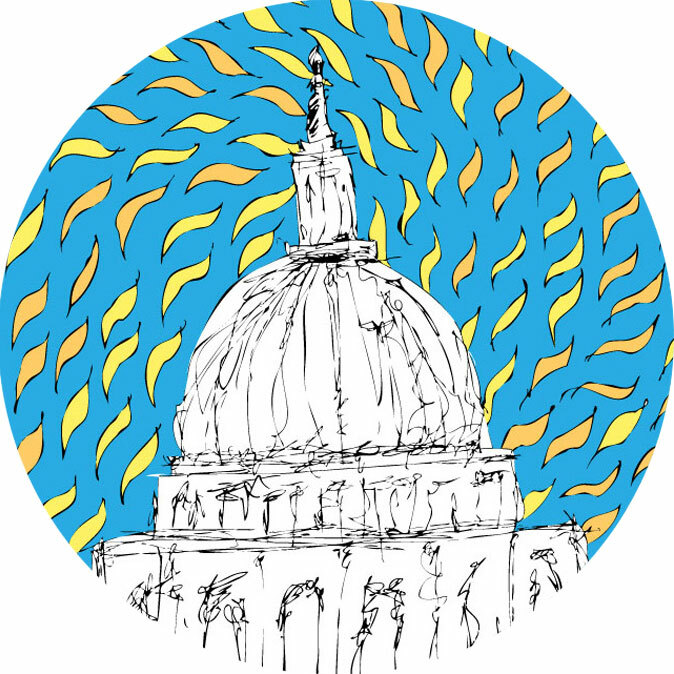 I’m definitely going to check out Current Boutique…thanks for sharing! This is great! i love your sense of style! 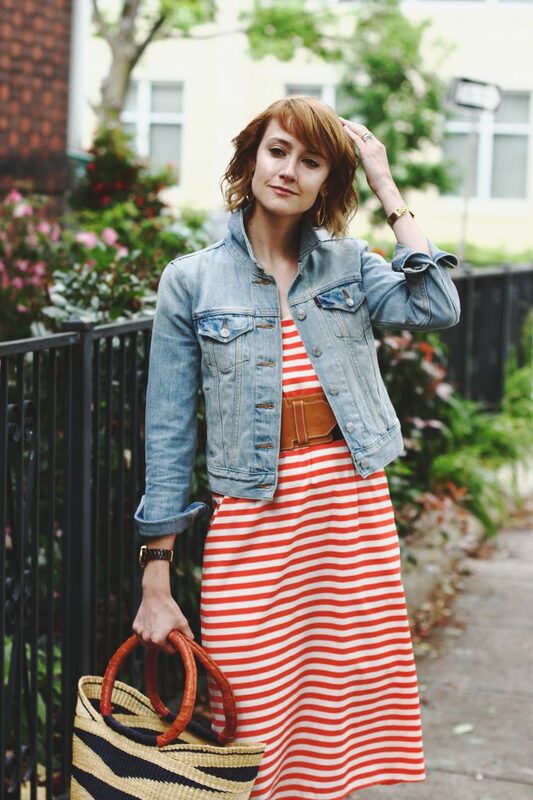 I love the stripe dress mixed with this denim jacket. Can’t without denim ! I love it , please keep going! The second hand shops are just starting to pick up here and I am soooo glad because I love a good thrift. What a pretty dress you found ! Next time I am in DC I have to stop by. I try to clean out pretty regularly too. It feels good! We are moving, so it is giving me a good excuse to go through things a little more thoroughly. Loving this backless number on you. Hot mama! 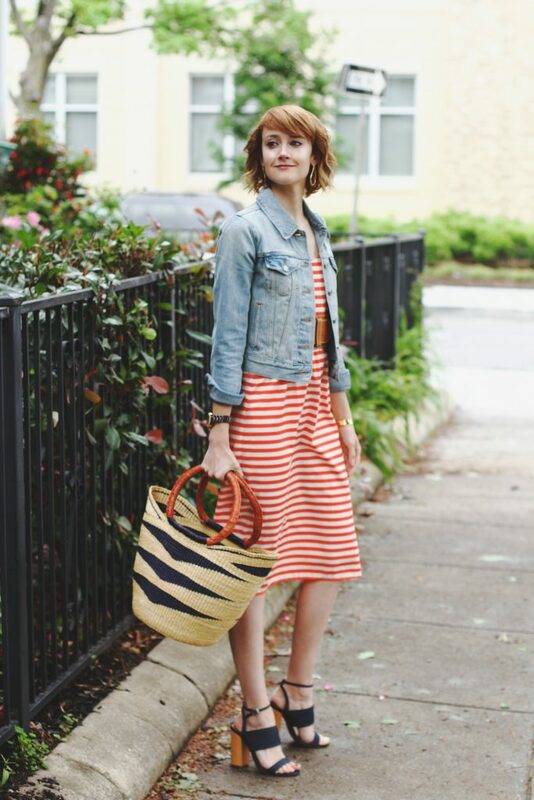 What a cute striped dress! You look so chic! 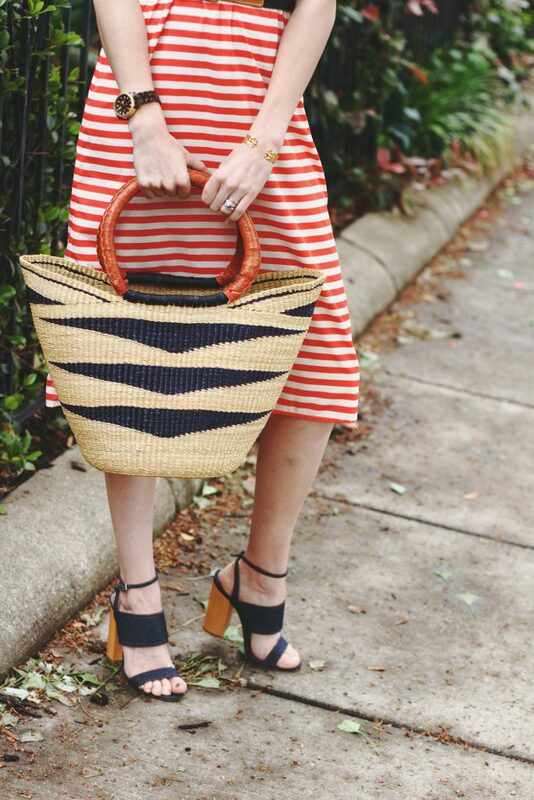 This is the perfect striped dress. You are a picture of spring and summer! I really have to clean my closet, so many things too! I love the dress by the way! You look great with this dress. Perks of living in indonesia you don’t get any spring, but when i used to live in europe it was something that I truly enjoyed doing and always give my old clothes to shelters. Such a cute dress, definitely a great find E 🙂 That local store sounds amazing, we have lots of charities over here where you can also find some gems (if you are lucky) at amazing prices. I have been planning a full wardrobe cleaning de-cluttering for weeks now but never seem to have enough energy to tackle the task *sigh* Happy week ahead, gorgeous! You look amazing in these dress and sandals. 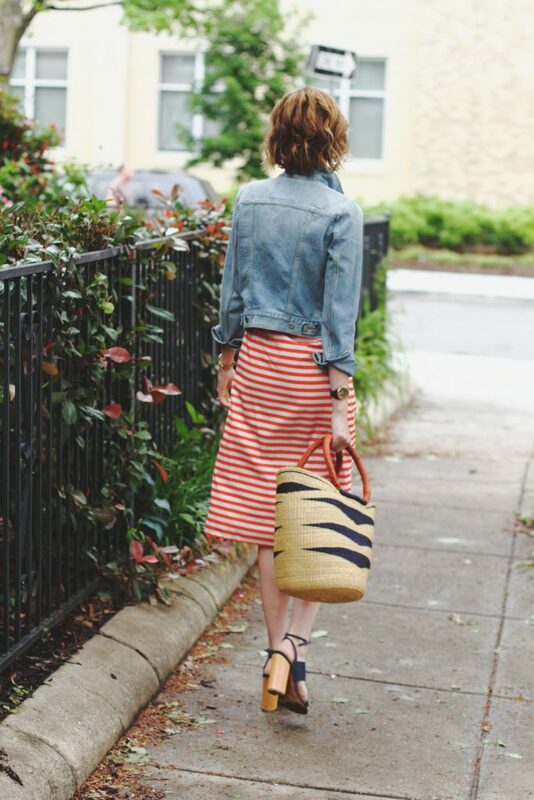 Oh, love this almost classy look “stripes + denim” !!! Your dress looking different with that belt and gorgeous back details. Denim jacket is definitely one must have, I am already looking for new one. Happy Thuesday babe! I love this dress!!! Pretty!!! What an amazing find with this dress! I love how you styled it! Your dress is very beautiful ! I love the red ! Wow, I’m really in love with your striped dress! I’ve been failing at spring cleaning!! I’ve been so busy and rushing around, maybe I’ll opt for summer cleaning instead, ha! I just love this dress on you, you wear it so well! Ohhh, I’m going to have to check them out next time I’m in the DC area! I haven’t heard of them before, but I’m currently on my own spring clean spree, so any consignment stores that operate online are welcome news. 🙂 This actually reminds me that I can bring in some items to places like Crossroads and Buffalo Exchange here in NYC. Not sure if they have locations in DC? I saw this dress on your IG and absolutely fell in love with it. I think it’s the perfect little item to wear out for a 4th of July celebration, especially with that denim jacket! It feels super summery. It is such a cute outfit ! LOVE the back of this dress, such a fun summer look! To be honest, I’m terrible with spring cleaning! Love your bag though.